An independent analysis commissioned by Sarasota County Government has concluded that the Baltimore Orioles generate approximately $89 million in annual economic impact on the county, the team has announced. 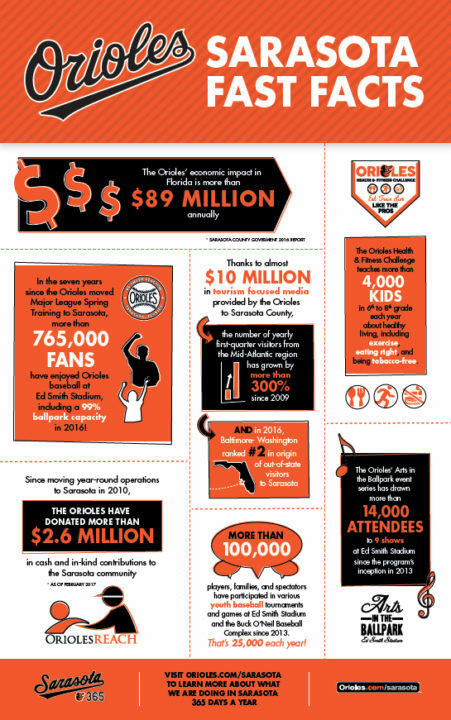 The funds are generated through the club’s marketing and promotion of Sarasota to its fan base throughout seven Mid-Atlantic States, combined with the commercial activity and corporate presence of the Orioles’ athletic training headquarters, production of public sporting and other entertainment events, and management of youth sports tournaments and recreational programs, an Orioles news release says. The figure “is a record for sports tourism creation in Sarasota County, far surpassing any current or past sports facility or private sports operator,” the release adds. “The Orioles’ annual economic impact result has grown in every year that it has been measured by the annual government study,” the release notes. The $89 million is more than two-and-a-half times the $35 million “the Orioles projected in testimony given before the Florida State Senate in 2004 and the Sarasota Board of County Commissioners in 2009, prior to the relocation of the Orioles’ year-round training headquarters, unique tourism marketing, and community sports park concept to Sarasota,” the release says. The analysis was conducted by Research & Marketing Strategies Inc., the release adds. Year-round professional event management, including production of Major League baseball games. The presentation at Ed Smith Stadium of the home games of the Gulf Coast League Orioles, along with Minor League training throughout the year. Presentation of a series of arts, cultural, and community events and programming, including the Orioles’ Arts in the Ballpark series, featuring the Sarasota Orchestra; Nashville’s Music Row Comes to the Ballpark fundraising event to benefit the Library Foundation for Sarasota County; the Orioles’ Eat, Live, and Train like the O’s Health and Fitness Challenge; and youth baseball tournaments held for tens of thousands of tourists, as well as families who live in the area. Sarasota 365 marketing and promotional campaign executed by the Orioles to benefit Sarasota County’s Visit Sarasota tourism agency; it utilizes the Orioles’ multimedia television, digital, social media and radio platforms, and features special events at the team’s home field, Camden Yards in Baltimore. “The Orioles’ results were bolstered by record attendance at Spring Training games in 2016,” the release points out. Last year, the Orioles set a franchise record with 11 sellouts, drawing more than 119,000 fans over 16 home games, the release says. 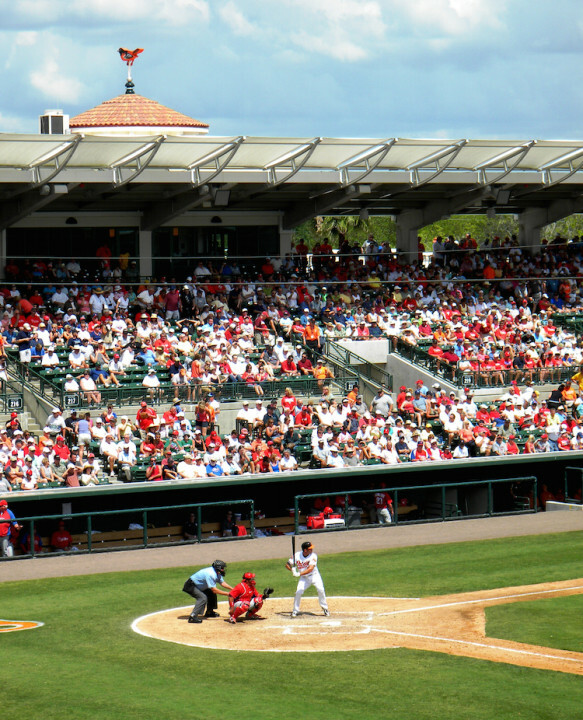 “That figure is more than double the average Spring Training attendance at Ed Smith Stadium prior to the Orioles’ arrival in Sarasota,” the release adds. Since the Orioles moved their Spring Training operations to Sarasota in 2010, more than 765,000 fans have enjoyed games at Ed Smith Stadium, the release notes.